Leonard Harrison State Park. PA Grand Canyon State Parks. 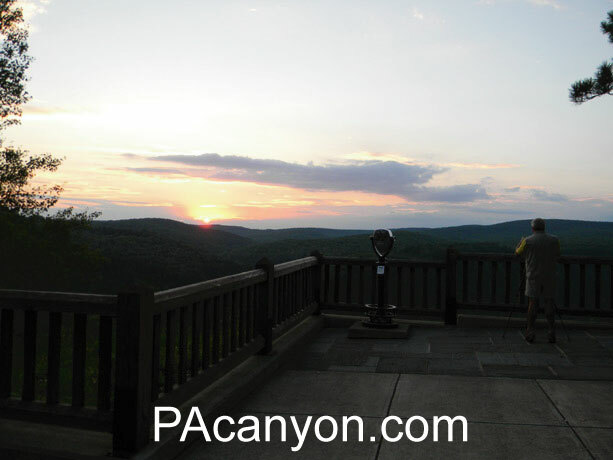 Leonard Harrison State Park is the site of the PA Grand Canyon’s most popular Vista View. It can be accessed via Rt 660 traveling west from Wellsboro, Pa. If you are arriving from the West via Rt 6, take Rt 362 from Ansonia toward Wellsboro, then rt 660 to the premier canyon overlook. The panoramic perspective provided by this well developed State Park area is some of Pennsylvania's most precious scenery. Visitors can look toward either end of the Pine Creek Gorge, which has become known as The Pennsylvania Grand Canyon, and view the severe topography. The ages of ice and moving rock that have carved this ancient Canyon of a Gorge, leave now a perfect playground of wonder. The gorge was formed by the movement of the Laurentide continental glacier, which pushed rocks and earth forming a damn and hence forming a lake from the glacial melt off. When the natural dam gave way, the flow of Pine Creek was sent southwest. Thousands of years of water flowing through the canyon have continued to carve its natural beauty. From top-notch trout fishing to white water boating, the mighty Pine provides recreation with a backdrop of awesome beauty. Leonard Harrison State Park offers wondrous views, or should we say gorge-ous views of the PA Grand Canyon, which of course offers sumptuous scenery year round. Spring, summer, fall, winter, each has its own wonder and particular aesthetic charm, but perhaps most wondrous is the time when The Canyon displays spectacular fall colors, when the leaves of the deciduous trees turn various shades of orange, yellow and red, providing one of nature's most colorful metamorphic spectacles. Leonard Harrison state park is a perfect place to start your Canyon Adventure. Here you'll find a snack bar, picnic tables and seasonal bathrooms. 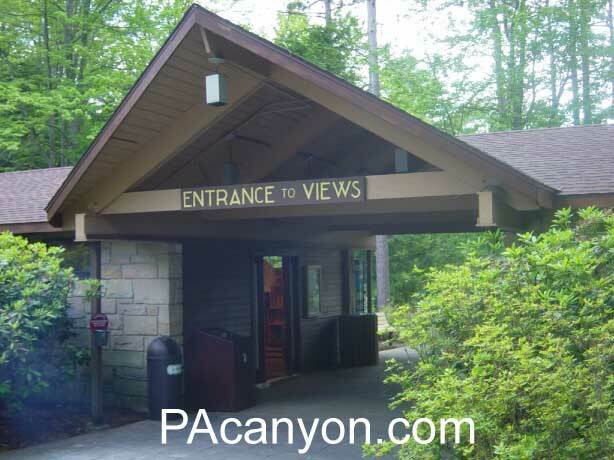 The overlook area is handicap accessible with a large parking area. One of the area’s favorite hiking trails departs from Leonard Harrison State Park Overlook. The turkey path, a steep, but well-developed trail, descends to the canyon floor where you'll find the Pine Creek Rail Trail, and of course the mighty Pine herself. Always check weather and trail conditions before attempting this or any other hike, and wear proper clothing. The area provides many recreational opportunities, from hiking and biking, to white water rafting and just plain relaxing. A walk or a bike ride on the Pine Creek Rail Trail is always a priority when visiting the Pennsylvania Grand Canyon. If you're looking for a place to spend the night, or several nights, the area offers a wide range of accommodations. Find lodging near Leonard Harrison State Park, the Pennsylvania Grand Canyon and throughout the canyon area. Area lodging includes newly constructed motels with easy access from the main highways, and new and historic area motels and hotels that have maintained that small town charm. You'll also find camping, cottages, cabins, and vacation rental properties throughout the area, and throughout Tioga, Potter and Lycoming Counties. While touring the Vista Overlooks, you will not want to miss Colton Point State Park on the west rim of the canyon. It is an enjoyable drive to the Colton Point Overlook where you will find other fabulous views of the canyon / gorge. The Turkey Path and Overlook trails at Leonard Harrison State Park and Colton Point State Park are closed during the winter months from the Wednesday before Thanksgiving to the second Friday in April. Leonard Harrison state park has camping facilities with flush toilets and showers. The camping area is open on the second Friday in April to the third Sunday in October. To make reservations or to get information about this or any other Pennsylvania State Park, call 888-PA-PARKS.